Last time, we decided that at 16:58:38 GMT, it was 'Solar Noon' at my location. That was the moment the Sun reached it's peak in the sky. More importantly, it was the moment that the Sun crossed my meridian -- the line of Longitude that I was standing on at that moment. In other words, at 16:58:38 GMT, the Sun and I were on the same Longitude. So if we can find the longitude of the Sun at that moment, we will know my longitude. It's that easy. How do we find the Sun's longitude at that exact moment? From the Nautical Almanac, of course. The Sun's longitude at any particular time (GMT, of course), is called its Greenwich Hour Angle, in celestial navigation lingo. More commonly abbreviated as GHA. 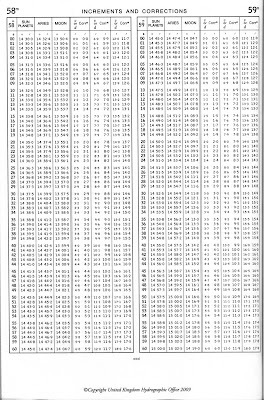 The Daily Page of the Nautical Almanac lists the Sun's GHA for every hour of the day. It's under the 'Sun' column on the left side, labeled 'GHA'. We will use the information on the Daily page to find the GHA of the Sun at the nearest hour: 16:00:00 GMT. 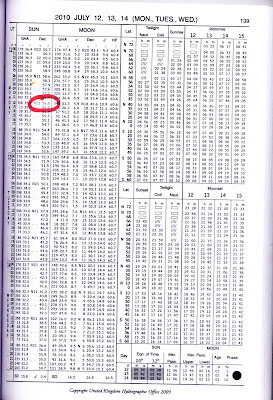 If you inspect the table, you will see that, at that time, the Sun's GHA was 58° 35.2'. Next we need to look up how far the Sun traveled in the next 58 minutes and 38 seconds. Again, the Nautical Almanac provides the answer. 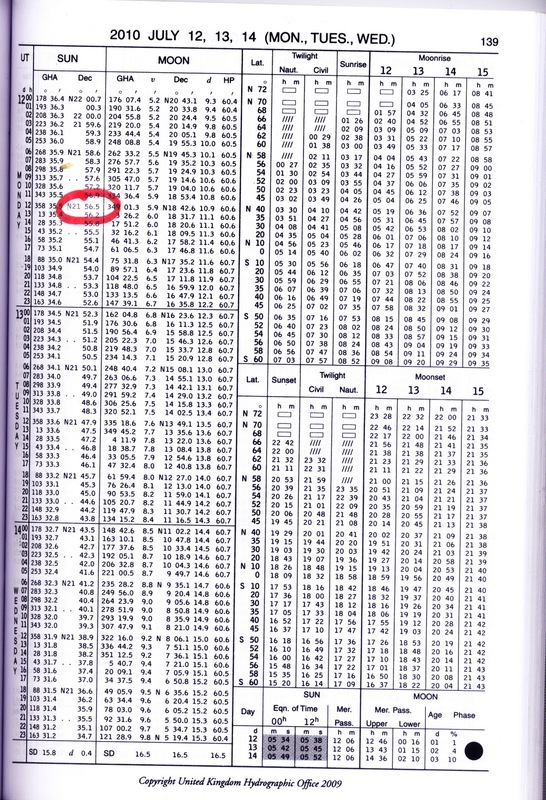 In the Nautical Almanac, the "Increments and Corrections" pages list how far the Sun (and Moon and planets and stars) move through the sky from 0 seconds, up to 1 hour. 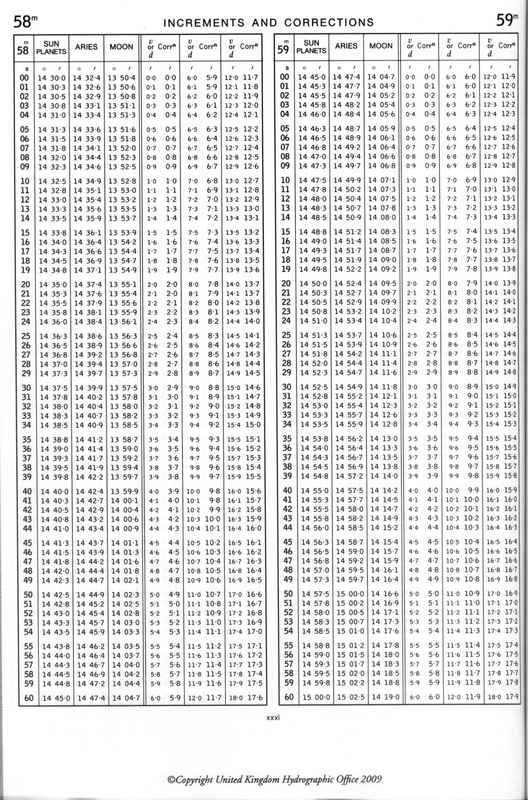 Since we want to know how far the Sun moved in 58 minutes and 38 seconds, we turn to the 58 Minute page (click on the above image for a closer look). The seconds are listed down the left side. The Sun's incremental GHA is in the first column on the left. If you follow the seconds down to 38, you will find the incremental GHA for 58:38. It's 14° 39.5'. And since that, dear reader, was the Sun's longitude at solar noon, it was also my longitude. At least according to my sights and calculations. N40° 40' 6" W73° 14' 42"
Using Google Maps, we can map this location to see how we did. On the map are two blue markers. The top one is at N40° 40' 6" W73° 14' 42". 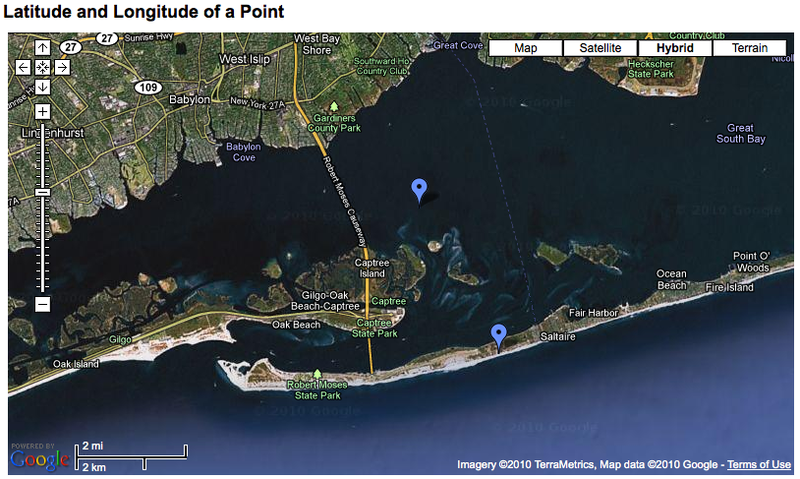 It's in the middle of the Great South Bay, just east of the Robert Moses Causeway, that goes out to Fire Island. My actual location was on the beach at Fire Island, just opposite the light house, at N40° 37' 48" W73° 13' 03". Those two points are 2.8 nm apart. Disappointed? Don't be! Although you will read that it's possible to get sextant fixes within .2 nm, I've never seen this in actual practice. If I can get within 5nm, I feel I'm doing pretty good. In a small boat, with a healthy chop or swell, 20nm is more like it. And 5-20nm accuracy is good enough for actual use. If you were crossing the Atlantic, say, and were taking daily noon Sun fixes, a 5nm accuracy would be more than you could use on a big Atlantic chart. And by the time you got within 20nm, you'd be on deck, scanning the horizon, waiting to say "Land Ho!" as loud as you could. How could you improve these results? You'd probably get more accurate sights with a good, metal sextant, like an Astra IIIb . A metal sextant will have a more stable Index Error, a better scope, and more precise vernier. However, a sextant is only as good as the Navigator. It takes a lot of judgment and skill to line up the Sun with the horizon. Especially when the Navigator is being thrown around the companionway, and the horizon looks like the business side of a saw. It also takes skill to plot the sights and draw a smooth, symmetrical noon curve -- particularly when the sights are not as neat and clean as you get from dry land. This kind of skill only comes from months or years of daily practice. The kind of practice you'd get on an Atlantic crossing. If you're like me, you only dream of getting that kind of practice, but at least now you know what to do if you ever get the chance! Bottom line, a sextant is not a GPS. That's why GPS -- let's not pretend here -- has rendered the sextant obsolete as a navigation instrument. On the other hand, finding your location using a sextant is a heck of a lot more fun! And that's what this has all been about. A bit of summer fun, learning a new skill. My goal has been to conduct you through this first fix with as little math and mumbo-jumbo as possible, to show you that Celestial Navigation is not rocket science or black magic. If I've done my job well, you should be saying to yourself, "Hey, that wasn't so hard, after all!" I hope it's been as much fun for you as it's been for me. I'll try to take another set of sights next week, so you can try to work one on your own. Until then, if you have any questions, please leave them in the comments section below, or email them to john@unlikelyboatbuilder.com. Speaking as a rocket scientist, I have to commend you on your no nonsense explanation of celestial navigation. that was excellent. the bite sized bits were just about right. you've inspired me to get the sextant out when i get back to the boat in a couple of days and really start learning. many thanks. For those who live at or near the beach, or the shores of any large lake, there will, likely most of the time, be a handy horizon to practice sights against. For those less fortunate, try an ARTIFICIAL HORIZON. They come in various "flavors", and can be had for from about $25 to just about as much as one might be willing to spend, see celestaire.com, with which I have no connection. For the "thrifty" you can make your own, a "dish" OF WATER, OIL OR MERCURY, if you can find any of this last. You might have to rig your own sun shades/wind shields, but it's dooable, or buy one. May I say how much I love your blog? I read both the building and navigation segments. I am going to attempt a canoe for rivers in France this winter. I just stumbled upon this. What a wonderful explanation! I have tried on several occasions to understand this and now I finally do. So, thanks very much! The only thing I got hung up on (briefly) was that your horizon line passes through the center of the earth. I think (and I may be wrong) the actual horizon line is a line tangent to the earth at the observer's position. But since that would be parallel to your line, it makes no difference, and your line makes the angles easier to understand. Question: Is the earth's rotational speed constant and, if so, would it not be possible to calculate the longitude rather than looking up the GHA in the Almanac? I doubt it is constant, though obviously the GHA table *is* calculated somehow. Probably too complex to do on the fly though.